Andrew Parratt in action for Hartshead Moor against Brighouse last Saturday. Cleckheaton reached the Priestley Cup quarter-finals thanks to the efforts of opening bowler Iain Wardlaw. The paceman claimed 6-57 as Undercliffe were restricted to 258-9 in reply to Ceckheaton’s 272-8. Gulsheraz Ahmed (66) and Fahim Ashraf (58) led the way for Undercliffe but they fell 14 runs short after Richard Whitehurst (49), Andy Gorrod (44), John Wood (35) and James Lee (33) shone for Cleckheaton. Holders Pudsey St Lawrence secured their place in the last eight with a second win of the weekend over Hanging Heaton . Opening batsman Mark Robertshaw hit an unbeaten 107 as Lawrence overhauled Heaton’s 251-9 with 21 balls to spare. Robertshaw shared an opening stand of 147 with Adam Waite (79) after Ian Philliskirk and Nick Connolly both made 71 for Heaton. 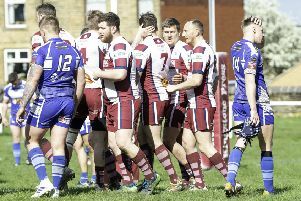 Woodlands were knocked out by a New Farnley side who have reached the quarter-finals for the first time. Rishy Limbechaya (59) and Mark Lawson (49) shared a sixth-wicket stand of 101 as New Farnley made 208-8. Woodlands lost early wickets to Lawson (4-28) and slumped to 74-6. Chris Brice (67) and Grant Soames (41) tried to revive their side but Woodlands were all out for 172. Hartshead Moor were the day’s unluckiest losers. They went down narrowly on run rate when their match at Yeadon was halted by rain. Yeadon’s overall run rate for their 50 over innings of 230-7 was 4.6. Hartshead Moor, who made 193-7 in 42 overs, had a run rate of 4.5. Oliver Halliday (47), Oliver Stephenson (45) and captain James Todd (43) led the Yeadon innings, while Richard Ferry (61), Faha ul-Haq (37no) and Arun Balasubramanian (45no) were Moor’s top scorers. Cup quarter-final draw: Bankfoot v Pudsey Congs, Bradford & Bingley v Pudsey SL, Lightcliffe v Cleckheaton, New Farnlet v Yeadon. Priestley Shield quarter-final draw: Scholes v Brad & Bing or Hartshead Moor, Pudsey SL v Bowling OL, Saltaire v East Bierley, Morley v Bankfoot. Ties to be played Sunday June 14.